It is no secret that many people consider their mobile devices to be the lifeline that connects them to the rest of the world. Our lifestyles increasingly demand instant access to information and results, and that includes when we’re on-the-go. A recent survey conducted by Google indicated that search is on the rise… and search after 6 pm is dominated by mobile users. This means that a vital component of your CMS ecosystem is its capacity to seamlessly translate your content into a mobile-friendly format. 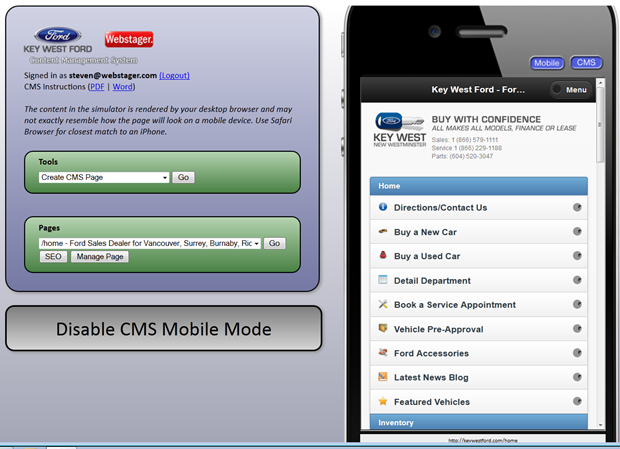 Mobile is no longer just another marketing channel – it is a key element of any successful business model. Your ability to reach your customer base is dependent on harnessing mobile media to increase brand awareness, generate leads and ultimately win the sale. Ensuring scalable content can be delivered to mobile devices is an important part of any business or enterprise as more and more people demand such experiences across virtually all industries. All your devices are important – that’s why it is a must that your interfaces are as easy to master as possible and from a common dash board. Our platform connects all the parts from a logical dashboard that visually simulates the experience before deployment and allows for scheduled delivery. All from the same single dashboard. The OneBigBroadcast platform seamlessly integrates with smartphones are other mobile devices. Create, deploy and manage your customer’s mobile experience from our easy-to-use Mobile Simulator, and analyse mobile traffic patterns to harness this critical interface between you and your customer base. Contact us for a demo and find out how the OneBigBroadcast ecosystem can optimize your mobile applications and win the attention of your mobile clientele.